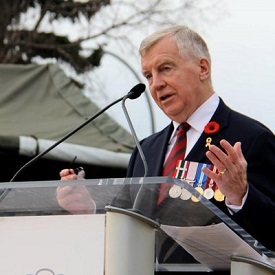 The Honourable Laurie Hawn, PC, CD was the Member of Parliament for the federal riding of Edmonton Centre and a member of the Conservative Party caucus. Born on Mother’s Day, 1947 and raised in Winnipeg, Laurie Hawn joined the Royal Canadian Air Force in 1964 and received his pilot wings in 1967. In over thirty years in the Air Force, Laurie rose to the rank of Lieutenant-Colonel and served an additional five years as Honourary Colonel of 417 Combat Support Squadron. Laurie held many senior staff positions, commanded a CF-18 Tactical Fighter Squadron and was the Wing Operations Officer at 4 Wing Cold Lake. Upon retirement in 1994, Laurie entered the financial services business. He successfully opened and managed branch offices and held senior supervisory positions in this highly regulated and demanding industry. Laurie has been very involved in his community, as a lead organizer, volunteer and board member supporting community events, educational institutions and many charities. Laurie was politically active for several years and decided, in 2003, that it was time to throw his hat into the ring of federal politics. After narrowly losing a hard-fought election against Deputy Prime Minister Anne McLellan in 2004, patience and hard work were rewarded on January 23rd, 2006 with a decisive victory over Ms. McLellan, and the opportunity to take a seat in Parliament. Re-elected in October 2008 and May 2011, Laurie has been proud to be part of Canada’s government as it takes steps to rebuild the military, reduce the tax burden on ordinary working Canadians, improve the accountability of government, crack down on crime, and face economic challenges. In the 40th Parliament Laurie served on the Standing Committee on National Defence, as well as the Special Committee on the Canadian Mission in Afghanistan. He also chaired the Special Legislative Committee on Bill C-30, the Clean Air Act, and served on the Standing Committee on Public Safety and National Security. On October 10, 2007 Laurie was appointed Parliamentary Secretary to the Minister of National Defence, the Honourable Peter MacKay. In this role Laurie assisted the Minister and provided a link between the ministry and Parliament. He represented the Minister in the House and at events when the Minister is unavailable. He served in this position until May 25, 2011. On October 1, 2010 Prime Minister Stephen Harper announced Laurie’s appointment to the Queen’s Privy Council of Canada, with the swearing-in being the first official act by Canada’s new Governor-General, His Excellency David Johnston. On May 25, 2011 Prime Minister Stephen Harper appointed Laurie to the Treasury Board sub-committee on the Strategic and Operating Review, and later to the Treasury Board Cabinet Committee and the Treasury Board Cabinet Sub-Committee on Government Administration. These unique appointments were a precedent, as previously only Cabinet Ministers were assigned to Cabinet Committees. Laurie also served on the Standing Committees of Veterans Affairs; Access to Information, Privacy and Ethics; and Procedures and House Affairs. Laurie was also selected as a Canadian representative and co-chair of the Permanent Canada-United States Joint Board of Defence. Created in 1940, the bi-annual PJBD is the highest-level bilateral forum for the discussion of defence and security issues of concern to both Canada and the United States. Laurie and Judy have been married for nearly 47 years, have two married children and two grandchildren.